Here’s a fun fact for you: President George W. Bush and President John F. Kennedy were both avid cyclists. They enjoyed the simple pleasure of riding bike outside, even before becoming presidents. 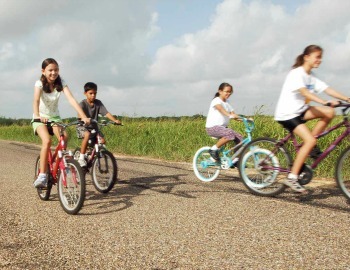 In honor of President’s Day, (Monday, February 18th), we present you with this list of fun places in Texas to ride a bike and enjoy the wonders of nature. Riding bikes is a fun activity that multi-generations can participate together to stay healthy and explore the outdoors. Austin: Violet Crown Trail Beginning at Zilker Park, the Violet Crown Trail follows Barton Creek Greenbelt along some of the most stunning and well-loved areas of Barton Creek, from Campbell’s Hole and The Flats to several popular climbing walls. There are two additional trailheads along this section which can be used for entry/exit, the Spyglass Trailhead and the Gus Fruh Trailhead. This map shows the section that ends at the 360 trailhead, about 4 miles down the trail from Zilker Park. Both trailheads, 360 and Zilker, offer parking for trail users. Caprock: Caprock Canyons State Park This fun route travels over 12 miles on many of the single track trails in the park like the Canyon Rim Trail, Mesa Trail, and Lower Canyon Trail. Some sections of trail are less traveled and receive less maintenance (that might have been because of recent weather). Still, there are plenty of good views, rocky downhills, and climbs. Be mindful of where you are, trails aren't well signed, so keep an eye on your surroundings! Coastal Bend: Holly Hike & Bike Trail. The Holly Hike and Bike Trail is made up of several miles single-track paths for all bikers, novice or experienced. Most paths are paved; however, the area does offer rougher, natural terrain at several intersections throughout the trail. The trail is easily affected by water, so be wary of your surroundings. Find the trail head at the northern tip of the Oso Bay Wetlands Preserve where it meets Holly Road. Dallas/Fort Worth: North Shore Trail is one of the most popular hiking and biking trails in North Texas. The trail runs for that runs for 9 to 10 miles from Rockledge Park to Twin Coves Park on the north side of Lake Grapevine. North Shore Trail offers up moderately difficult terrain and beautiful views from the lake’s cliffs and shores. The trail is safe for both bicycle riders and hikers, but you should use caution as there are some rough points. We will show a video at the bottom of the page that displays some of the terrain. You can start either in Rockledge Park, Twin Coves Park, or Murrell Park. All three parks have trail heads and designated parking for the trail. Houston: George Bush Hike & Bike Trail. The George Bush Park Hike and Bike Trail, in western Houston, starts at the west end of the Terry Hershey Park Hike and Bike Trail and, together, they offer a continuous 22-mile ride. The park itself sprawls 7,800 acres and has several recreational amenities, including ballfields, picnic areas, a shooting range, and wildlife habitat. Note that the park's paved trail is largely unshaded. Pineywoods: Caddo Lake Loop. The historic town of Jefferson lies on Big Cypress Bayou near the western edge of Caddo Lake, part of the thickly forested state park. This former 19th-century seaport serves as a launching point for cyclists wishing to explore the state park. A 33-mile loop utilizes portions of Texas highways 43 and 49 and other two-lane roadways. Coasting over rolling hills and around swampy bayous, cyclists return to Jefferson where small hotels and cafes serve as a home base for further excursions in the Caddo Lake region. Rio Grande Valley: Hidalgo Loop. This bike ride starts and ends at the Burger King parking lot at the corner of FM 495 and Conway. It eventually loops back around to the Arena in Hidalgo. Enjoy the city sites on this mostly flat 30-mile bike path. How many miles are you going to put in today? San Antonio: Robert L.B. Tobin Park offers San Antonio an opportunity to spend time enjoying the outdoors, with fresh air, sunshine and exercise on tap for visitors. Take a bike ride, enjoy the scenery, and de-stress on our 2-mile long segment of the Salado Creek Greenway we call the Tobin Park Loop.